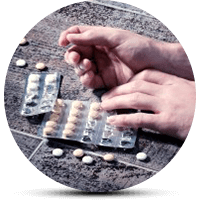 Amphetamine overdose occurs when you take too much of it within a short period of time. Your risk is higher if you smoke or inject it. This is common among the drug abusers who may take dangerously high doses in the quest for an extra high. Amphetamine makes up a class of medications known as CNS stimulants. There are many other closely related medications. Notably, you can get them only from your doctor’s prescription. Immediate-release tablets of amphetamines treat ADHD in children (above 6 years). Similarly, people use them to treat narcolepsy, a sleep disorder that causes too much sleepiness. Some over-the-counter diet pills also contain amphetamine. Therefore, there are chances you may overdose it accidentally or intentionally. What Are The Symptoms Of Amphetamine Overdose? Overdose symptoms occur in two phases. First, the initial phase causes an excitation of the body functions. Then, a depressive phase follows this. The symptoms depression include low moods and excessive physical weakness. In addition, you may also have muscle pain, nausea, vomiting, diarrhea, and abdominal cramps. Even so, convulsions and coma are not uncommon in very severe cases. In addition, the degree of psychosis also depends on the total amount consumed. Up to 18% of individuals report psychosis-like symptoms. However, this is even though a full-blown psychosis may not be present. Amphetamine overdose occurs at different doses for different people. Indeed, toxic reactions have been observed in patients who took 30 mg Amphetamine. This is according to the US National Library of Medicine Toxicology Data Network. However, a dose as high as 500 mg may not be fatal in all the cases. What actually determines the degree of severity of amphetamine overdose? It is the amount of the drug present in the blood and the brain. For example, if you abuse it by injection, the toxic effects are more likely to cause fatalities. If you have been abusing it for a long time, you may be able to digest larger doses. As a result, you may live without any significant toxic effects. Amphetamine possesses mind-altering properties. It does so by changing the levels of chemicals in the brain. These brain chemicals, also called neurotransmitters, help communication among the brain cells. Moreover, being oil-soluble, it reaches the brain rapidly after eating or injecting. Neurotransmitters also affect many parts of the body in different ways. For example, they may affect memory, emotions, thinking ability and other physiological functions. Amphetamine increases the activity of the neurotransmitters dopamine and norepinephrine in the brain. In addition, it also induces the release of other neurotransmitters. They are epinephrine, histamine, and serotonin. Having high levels of dopamine in the brain gives you the feelings of pleasure and reward. Of course, this is the reason why Amphetamine is very addictive and quitting is such a tough task. When you overdose, the first set of symptoms is mainly excitatory in nature. However, within hours, the Amphetamine binding sites in the brain will become full. After, when the excitation plunges, the symptoms of depression begin to manifest. Sometimes, accidental or intentional overdose may cause death. However, there are only a few such instances. Furthermore, the risk of death is higher if you overdose it with other drugs. Also, your are more likely to die due to the overdose if you have certain conditions. They include high blood pressure or had some heart disorders at birth. Tragically, there are certain symptoms that usually precede death. They include hyperthermia, convulsions, and very low blood pressure. Treatments are supportive in nature and aim to relieve the signs of overdose. While, there is no known antidote to treat Amphetamine overdose. Still, there are medications help to improve the overdose symptoms and ease the recovery. Fortunately, an immediate treatment produces successful results in almost every case of overdose. Activated charcoal – if the patient is conscious and able to take it by mouth. Also, this treatment is more effective if the time of Amphetamine overdose has not gone beyond a few hours. This may help to reduce its absorption inside the digestive tract. Amphetamine Overdose: Who Are At Risk? Do you or someone you know have Amphetamine overdose? Call your local emergency number 911. Or call the national toll-free Poison Help hotline (1-800-222-1222). You can reach it from anywhere in the United States.